John Adam Belushi (born January 24, 1949 – died March 5, 1982) was an American actor and comedian. John was born in the U.S. to Adam Belushi, an Albanian immigrant who left his native village, Qytezë, in 1934 at the age of 15, and his wife Agnes. John's brother James Belushi is also a successful actor and comedian. Belushi's first big break as a comedian occurred in 1971, when he joined The Second City comedy troupe in Chicago, Illinois. Thanks to his uncanny caricature of singer Joe Cocker's intense and jerky stage presence, he participated in National Lampoon's "Lemmings" stage show in 1972 (which also featured future Saturday Night Live performer Chevy Chase). From 1973 to 1975 the National Lampoon aired the Radio Hour, a half-hour comedy program syndicated across the country on approximately 600 stations. When original director Michael O'Donoghue quit in 1974, Belushi took over the reins until the show was cancelled. Other players on the show included future SNL regulars Gilda Radner, Bill Murray, Brian Doyle-Murray, Richard Belzer and Chevy Chase. Belushi married Judy Jacklin, an associate producer of the Radio Hour. A number of comic bits first performed on the Radio Hour would be translated into SNL sketches in the show's early seasons. Belushi achieved national fame with his work on Saturday Night Live, which he joined as one of the original cast members in 1975. 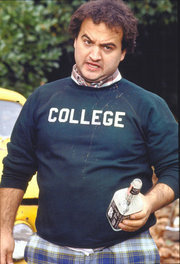 Between seasons of the show, he made one of his best-known movies, Animal House. He left Saturday Night Live in 1979 to pursue a film career, and he appeared in a number of movies, including The Blues Brothers (with Dan Aykroyd). Both the Animal House and the Blues Brothers albums went to number 1, making Belushi the only performing artist to concurrently attain momentary greatness in the two disciplines. He was also known to indulge in bouts of drinking and involvement with drugs which eventually cost him his life. John was found dead on March 5, 1982, at the age of 33, in a hotel room at the Chateau Marmont on Sunset Boulevard in Los Angeles, California. The cause of death was a speedball, a lethal injection of cocaine and heroin. His death was investigated by forensic pathologist Dr. Michael Baden, among others, and while there was some dispute in the findings it was eventually officially ruled a drug-related accident. There was some suspicion of foul play by his companion and drug dealer at the time, Cathy Smith. John's life is detailed in the biography "Wired: The Short Life and Fast Times of John Belushi" (Published in 1985) by Bob Woodward. John Belushi is interred in Abel's Hill Cemetery, Martha's Vineyard, Massachusetts. His widow later remarried and is now Judy Belushi Pisano.